New York: Crown Publishers, 2006. First Edition [Stated], First Printing [Stated]. Hardcover. Very good/Very good. ix, , 463,  pages. Endpaper maps of London and the North Atlantic Ocean. Illustrations. Notes and Sources. 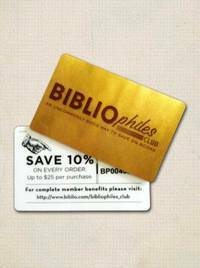 Archives and Bibliography. Illustration Credits. Index. DJ has slight wear and soiling. Erik Larson (born January 3, 1954) is an American journalist and author of nonfiction books. He has written a number of bestsellers, such as The Devil in the White City (2003), about the 1893 World's Columbian Exposition in Chicago and a series of murders by H. H. Holmes that were committed in the city around the time of the Fair; The Devil in the White City also won the 2004 Edgar Award in the Best Fact Crime category, among other awards. 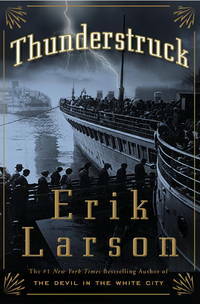 In "Thunderstruck," Erik Larson tells the interwoven stories of two men--Hawley Crippen, a very unlikely murderer, and Guglielmo Marconi, the obsessive creator of a seemingly supernatural means of communication--whose lives intersect during one of the greatest criminal chases of all time. Set in Edwardian London and on the stormy coasts of Cornwall, Cape Cod, and Nova Scotia, "Thunderstruck" evokes the dynamism of those years when great shipping companies competed to build the biggest, fastest ocean liners, scientific advances dazzled the public with visions of a world transformed, and the rich outdid one another with ostentatious displays of wealth. Against this background, Marconi races against incredible odds and relentless skepticism to perfect his invention: the wireless, a prime catalyst for the emergence of the world we know today. Meanwhile, Crippen, "the kindest of men," nearly commits the perfect crime. With his superb narrative skills, Erik Larson guides these parallel narratives toward a relentlessly suspenseful meeting on the waters of the North Atlantic. Along the way, he tells of a sad and tragic love affair that was described on the front pages of newspapers around the world, a chief inspector who found himself strangely sympathetic to the killer and his lover, and a driven and compelling inventor who transformed the way we communicate. "Thunderstruck" presents a vibrant portrait of an era of seances, science, and fog, inhabited by inventors, magicians, and Scotland Yard detectives, all presided over by the amiable and fun-loving Edward VII as the world slid inevitably toward the first great war of the twentieth century. Gripping from the first page, and rich with fascinating detail about the time, the people, and the new inventions that connect and divide us, "Thunderstruck" is splendid narrative history from a master of the form.